The Metropolitan Museum of Art will celebrate the winter holidays at all three of its locations—The Met Fifth Avenue, The Met Cloisters, and The Met Breuer—with a variety of holiday-themed events and performances, as well as its annual Christmas Tree and Neapolitan Baroque Crèche presentation, a display of a spectacular late-19th-century silver Menorah, and handcrafted medieval holiday decorations. At its location on Fifth Avenue, The Metropolitan Museum of Art will once again bring to life the traditions and spirit of the holiday season with decorations, programming, and more. 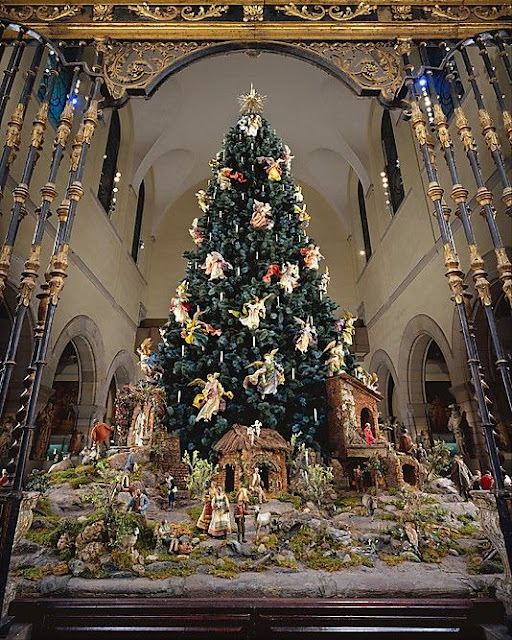 The Met will continue a long-standing holiday tradition with the presentation of its Christmas tree and 18th-century Neapolitan crèche, a favorite of both New Yorkers and visitors from around the world. The installation will be set in front of the 18th-century Spanish choir screen from the Cathedral of Valladolid in the Museum's Medieval Sculpture Hall (Gallery 305). Recorded Christmas music and daily lighting events will add to the enjoyment of the holiday display. The exhibition of the crèche is made possible by gifts to The Christmas Tree Fund and the Loretta Hines Howard Fund. The magnificently-lit, 20-foot blue spruce is gracefully adorned with 19 cherubs and 59 angels, while at the base an additional 71 figures represent the three elements of Nativity scenes that were traditional to 18th-century Naples: adoring shepherds and their flocks, the procession of the three Magi, and spirited peasants and townspeople. 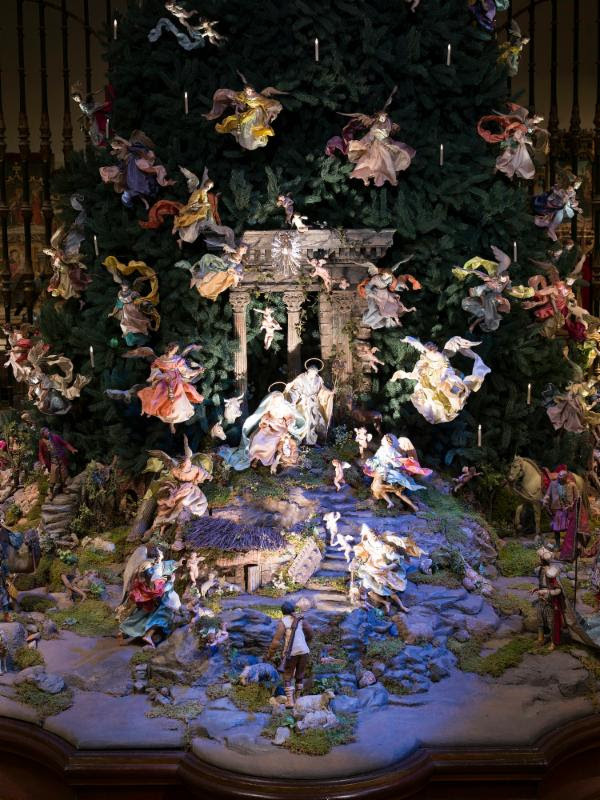 The display is enhanced by nearly 50 charming animals and by background pieces that create a dramatic setting for the Nativity; these include the ruins of a Roman temple, several quaint houses, and a typical Italian fountain. The annual Christmas display has evolved through the generosity, enthusiasm, and dedication of the late Loretta Hines Howard, who began collecting crèche figures in 1925. Mrs. Howard conceived the idea of presenting the elaborate Neapolitan Nativity scene under a Christmas tree—a tradition rooted in Northern Europe, with angels swirling upward to the crowning star—and was later ably assisted by her daughter Linn Howard. Over many decades, Linn Howard contributed to the tree's great beauty by adding and improving details that are fundamentally reflected in the current display. This unusual combination was first presented to the public in 1957, with The Met's exhibition of Mrs. Howard's collection. Since 1964, more than 200 18th century Neapolitan crèche figures have been given to the Museum by Loretta Hines Howard and displayed in the galleries each holiday season. Beginning Friday, November 25, tree lighting events will take place daily at 4:30 p.m., with additional ceremonies on Fridays and Saturdays at 5:30 and 6:30 p.m. All are free with Museum admission. More information on an accompanying audio guide is available on The Met website. 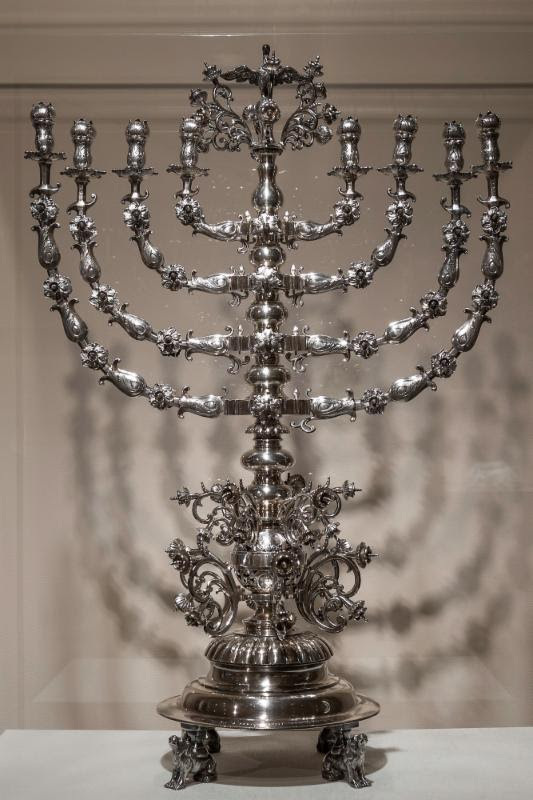 In conjunction with the celebration of Hanukkah—the Jewish Festival of Lights, observed this year from the evening of December 24through the evening of January 1—a magnificent, late 19th-century silver Menorah made in Lviv, Ukraine, will be on display in The Iris and B. Gerald Cantor Galleries (Floor 1, European Sculpture and Decorative Arts, Gallery 556) through January 12, 2017. Made in 1866–72 for the Great Synagogue in Lviv, the ceremonial lamp, which is cast, chased, and engraved with elaborate motifs, is one of the largest silver Hanukkah lamps known. The Menorah is on loan from The Moldovan Family Collection. The eight-branched Hanukkah Menorah commemorates an important moment in Jewish history: the triumphant Maccabean revolt against the oppressing Seleucid Empire and the re-consecration of the Jewish Holy Temple in 165 B.C. The lamp's eight branches reference the miracle in which the last jug of pure olive oil, which should have lasted only one day, kept the Temple Menorah alight for eight days. The exhibition Jerusalem 1000-1400: Every People Under Heaven (on view through January 8, 2017) demonstrates the key role that the Holy City, sacred to the three Abrahamic faiths—Judaism, Christianity, and Islam—played in shaping the art of that period. Also on view at The Met Fifth Avenue: Fragonard: Drawing Triumphant (through January 8, 2017), Valentin de Boulogne: Beyond Caravaggio (through January 16, 2017), Max Beckmann in New York (through February 20, 2017), Native American Masterpieces from the Charles and Valerie Diker Collection (through March 19, 2017), and the newly extended Fabergé from the Matilda Geddings Gray Foundation Collection (through November 30, 2021). On Friday, December 16, as part of the MetFridays series, Season Feels will offer an evening of art-making, music, and holiday cheer. Byzantine Pop-Up performances will take place in the Medieval Sculpture Hall, which will introduce visitors to hymns and carols of the Byzantine Empire sang in multiple languages. The Snowman has become a British holiday classic. This Academy Award-nominated animated film features a lush score, including the timeless song "Walking in the Air," that will be performed live by the Mannes Orchestra. The ultimate holiday tradition. Hear Handel's famous oratorio in its full version, or choose the hour-long "pocket" version. Tickets start at $40 for the "pocket" Messiah; $65 for the full oratorio. They have performed for every U.S. President since John F. Kennedy. America's favorite boy singers provide a delightful program of holiday hymns and carols. Leonora Duarte was one of the most brilliant composers of the 17th century. In this holiday program, the ensemble Sonnambula recreates a festive evening at the Duarte household with music by Leonora, her friends, and fellow musicians. A variety of dining options, from casual fare at The American Wing Café to a broader range of offerings at the Petrie Court Café, are offered at The Met Fifth Avenue. Cocktails, appetizers, and live music are available every Friday and Saturday evening at the Great Hall Balcony Bar. On the ground floor, near the entrance to the cafeteria, visitors can delight in a one-of-a-kind winter holiday scene sculpted in sugar and fondant. Handcrafted by The Met's James Beard Award-winning Pastry Chef Randy Eastman, the display will be on view from November 29, 2016, through January 6, 2017. The Met Store—located within the Museum's three locations, Rockefeller Center, and online—offers a wide selection of holiday gifts inspired by The Met collection, including greeting cards, calendars, holiday jewelry, and more. Purchase proceeds support the collection of 5,000 years of art and its study, conservation, and presentation. A new publication, The Metropolitan Museum of Art: Masterpiece Paintings, offers a unique opportunity to experience the unparalleled collection of The Met. This monumental, lavishly illustrated book features 500 masterpieces of painting from The Met collection, presented chronologically from the dawn of civilization to the present. At The Met Cloisters—the branch of the Museum in northern Manhattan that is dedicated to the art, architecture, and gardens of medieval Europe—decorations with a medieval theme and concerts of early music will ring in the season. December 5 through January 9, The Met Cloisters will present a beloved Museum tradition that evokes festive, medieval culture. 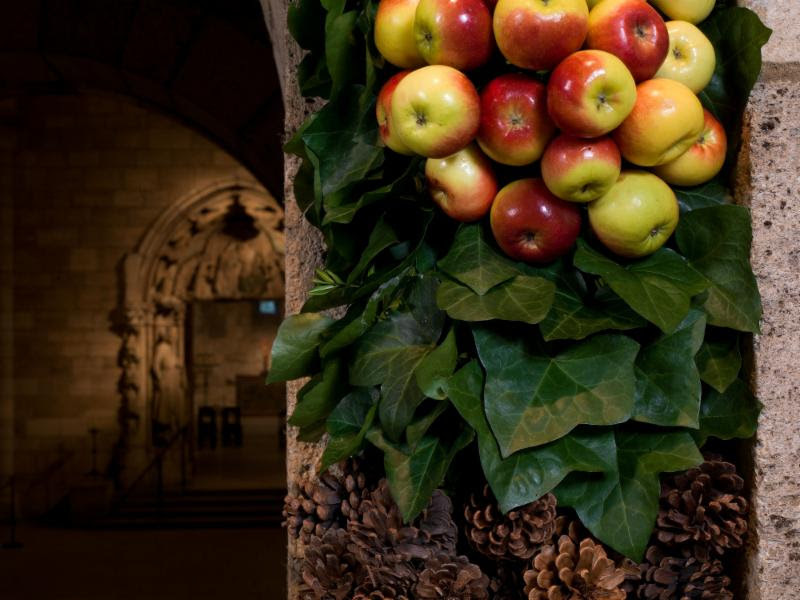 After passing under a great archway of holly boughs, symbolizing light, warmth, and welcome—visitors will be greeted in the Main Hall by grand displays of fresh ivy and hand-polished lady apples, hazelnuts, rosehips, and pinecones, all locally sourced. Throughout the halls, cloisters, galleries, and arcades, visitors will find warmth and inspiration in enchanting displays of verdant topiaries and wreaths, candelabras adorned with evergreens and roses, and fragrant potted plants that symbolize and celebrate the season. Saturday, December 10, and Sunday, December 11, 1 p.m. and 3 p.m.
Thirteen vocal and instrumental musicians create a sonic pageantry evoking the liturgical calendar and a deeply immersive experience of Christmastide. Saturday, December 17, and Sunday, December 18, 1 p.m. and 3 p.m. The Met Cloisters presents the first fully-staged musical production of the 12th-century Play of Adam, in a new verse translation from the original Anglo-Norman French. Thursday, December 19, and Friday, December 30, noon–3:30 p.m.
Family gallery workshops and a self-guided art hunt for children ages 4–12. The Museum's location for exploring the art of the 20th and 21st centuries through the lens of 5,000 years of art, The Met Breuer, which opened in March, will ring in its inaugural holiday season with performances and special holiday Monday hours. Usually closed on Mondays, The Met Breuer will be open on two Mondays this holiday season—December 26 and January 2. Hours are 10 a.m. to 5:30 p.m.
Kerry James Marshall: Mastry (through January 29, 2017) and Humor and Fantasy—The Berggruen Paul Klee Collection (through January 2, 2017) will be on view during the holiday season at The Met Breuer. From the haunting Hans Christian Andersen story. This Pulitzer Prize-winning composition by David Lang recounts the all-too-short life of the poor little girl who dies in the cold while envisioning the grandmother who loved her. Flora Bar, the new restaurant at The Met Breuer from restaurateur Thomas Carter and chef Ignacio Mattos—the team behind Manhattan restaurants Estela and Café Altro Paradiso—is now open. Visitors are invited to stop in for drinks and a casual meal or sit-down dinner at this full-service restaurant. Flora Bar is open Tuesday through Thursday, 5:30–10 p.m.; Friday and Saturday, 5:30–11 p.m.; Sunday, 5:30–11 p.m.; and closed Mondays. All three of The Met locations—The Met Fifth Avenue, The Met Cloisters, and The Met Breuer—are closed on Thanksgiving, December 25, and January 1. A full list of holiday programs is available at metmuseum.org/holidayconcerts. For tickets, visit metmuseum.org/tickets or call 212-570-3949.
the Museum's website and through its social media accounts on Facebook, Twitter, and Instagram using the hashtags #MetHolidays and #MetChristmasTree.